The Dubliner spotted that Royal Portrush had been set up for nightmare conditions and cruised around comfortably in light winds and sporadic early showers. The three time major winner three putted his final hole for par but still fired an effortless five under par 67 to trail leaders Jeev Milkha Singh and Gregory Bourdy by two shots. He said: “I basically holed just one decent putt today – I two-putted the first three par fives for birdies, chipped in on eight and hit it stone dead on three for the others. “So when you do that and shoot three under par it means you weren’t under much stress. It all felt pretty relaxed out there. “I think today they set up the golf course pretty easy with the weather forecast – and why does anybody ever believe an Irish weather forecast? “Everybody looks at the forecast, but I never do. It just baffles me. The bad weather did arrive in mid-afternoon, with the threat of lightning causing play to be suspended for 95 minutes. But by then Harrington and the other pace-setters were safely in the clubhouse, reflecting on a glut of good early scores – 61 of the 78 morning starters shot par or better. But despite the low scoring, Ireland’s triple Major winner insisted the tournament felt just like an Open Championship, especially with the sell-out 27,000 pressing close to the players. They will have to get used to it, as that attendance will be repeated over each of the next three days in the European Tour’s first toal sell-out. 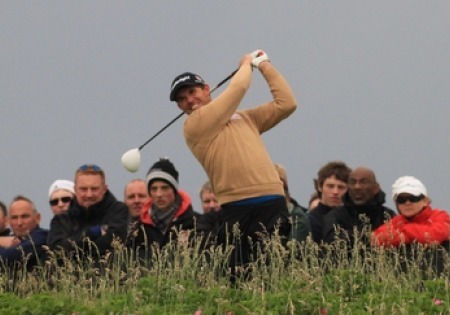 Harrington added: “I think the golf course and the venue, and the people, just everything about it would be a great venue for The Open. “I don’t think in any shape or form this golf course fails on its tee to green ability. “Can they move the people around the golf course? There are a number of tight spots to fit a lot of people through, but they can have a look at that this week. “But I’m not the person to comment on the drawbacks. I’m really only capable of commenting on the venue and the golf course, and it really is awesome. “It’s a joy to play this golf course, it really is a super course. It’s got a lot of testing golf shots on it, but it also gives you something if you hit a good shot. It rewards you out here. 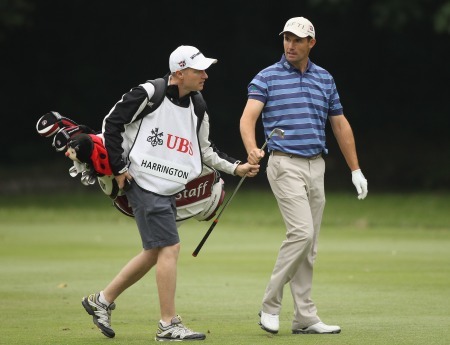 Harrington’s opening effort contained six birdies, and just one bogey, on the tricky fourth hole. His score was matched by playing partner Simon Dyson, with the defending champion overcoming a sloppy start that saw him bogey their opening hole, the par five tenth. He bounced back with four birdies and a brilliant eagle at the 528 yards second, where he hit his three wood second shot to three feet. Bourdy took full advantage of the local knowledge he picked up from Darren Clarke as a seven under par round of 65 moved him into the joint lead alongside Singh. The Frenchman carded a superb seven under par first round of 65 late in the day to join Singh at the top of the leaderboard and equal the course record at the Dunluce Links, just as the Indian had done earlier on a weather-affected opening day. 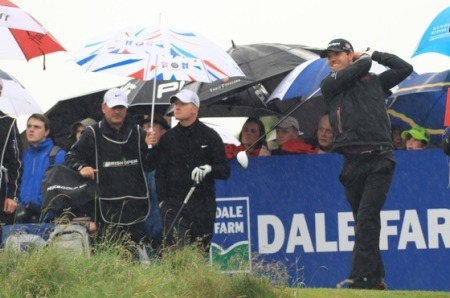 After playing his practice round on Tuesday alongside Royal Portrush regular Clarke, Bourdy did not sign for a single bogey as he racked up seven birdies in front of record crowds, with 23,283 attending the opening day. Play was suspended for 95 minutes midway through the opening round of the first Irish Open to be held in Northern Ireland since 1953, but Singh came in just before the delay and set the pace early on thanks chiefly to a six under par front nine of 30. Bourdy then followed suit, and he had a certain local hero to thank for his success. “I played with Darren on Tuesday and it was great,” he said. “He gave me a lot of advice, and it was fantastic to play with a guy who won The Open the year before, on his home course too. 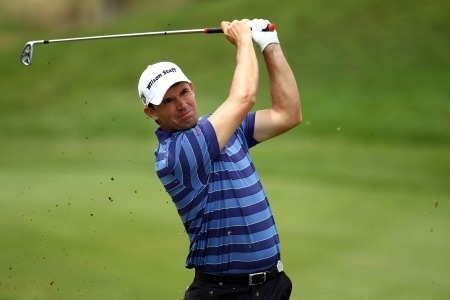 There were six players a shot off the lead on six under par, with France’s Edouard Dubois, Oscar Floren of Sweden, Englishmen Mark Foster and Andrew Marshall, Mikko Ilonen of Sweden and Matthew Zions of Australia all tied for third place. World Number Two Rory McIroy was five shots off the lead going into the second day after a two under par round of 70, while Graeme McDowell and Clarke were a shot further back on one under.